Ah the summer before 8th grade and Alice isn't a kid anymore, but not quite a teenager and feeling like she doesn't really fit anywhere. The age her mother dies has steadily gotten younger. In the first few books, she was 5. 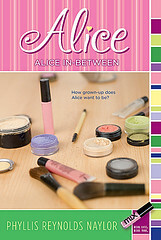 Then a few books ago, Alice said she was 4 or 5 when she died. Now she's saying she was 4. Bigger things are happening in this book-- more adult things. Early on she and Lester have to rescue Crystal from an octopus man and Alice needs that knowledge later in the book. Due to the increasing seriousness of the books, and the fact I'm sleep deprived means I keep crying when she's feeling particularly mother-less, I'm going to switch series to something a little more light-hearted. Jennie - I won the 5 book mooch points you donated! Thanks so much!